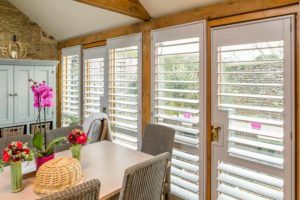 Plantation shutters in Royston by Just Shutters – The UK’s largest independent shutter specialists. The beautiful town of Royston has a rich and vibrant history, with housing styles to match. Shutters are the perfect window covering solution whether you have a town house looking for privacy, or a semi-rural retreat on the outskirts of town looking for character and style. Whatever you are looking for, we have the perfect solution for you. Plantation shutters in Royston from your local expert Tom Parrot (pictured below)! Tom has vast experience in all aspects of shutter design, manufacture and installation and brings a lifetime of passion and knowledge to the region. While shutters ‘per square meter’ price would be similar to a high-end curtain or blind, shutters are an investment in your home and long term provide much higher value than alternative window coverings. Shutters will not bleach, warp or discolour over time, they will not need replacing in a few years like lesser fabric options, they will be part of your home should you ever move on, with many estate agents finding them an added value product at point of sale. But most of all, they are an investment in you and your lifestyle. Please browse our shutter galleries for further inspiration and request a free brochure or book an appointment here (or call 01223 632887) to see what our Royston Shutter Expert can offer you and your home. You may also like to see local pages for Plantation Shutters Rye and Hertfordshire Plantation Shutters. We have gathered an unrivalled reputation for quality of product and service. We are delighted that we are the shutter experts in Hertfordshire and the surrounding counties of Essex and Oxfordshire also, please see our coverage on our contact page. Please see Checkatrade for over 1600 unbiased customer reviews that make us the most recommended Shutter Specialists in the South. Shutters Fitted shutters to 7 windows.